Twelve years ago my parents moved from the Pennsylvania home of my childhood to a smaller, single-floor residence in sunny Florida. A part of that process was scaling down their property to what was essential. A lot of stuff was sold, donated, given away, or just tossed. It was a time-consuming process that would have been avoided entirely with a little “Döstädning” or Swedish Death Cleaning. No, I don’t mean scrubbing the house while blasting “The Eagle Flies Alone” by ARCH ENEMY on the stereo. Instead, Swedish Death Cleaning refers to the conscious, methodical reduction of clutter over time, typically starting at age 50, and going until the end takes you. It sounds morbid, but it’s actually a very thoughtful thing to do. Speak about it always. Tell others what you’re doing, she says, so they can hold you accountable. 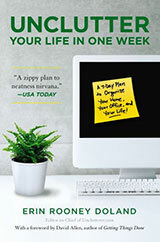 Reward your efforts with life-affirming activities. See a movie, attend a concert, enjoy a fantastic meal. Of course, you need not be in your 50’s — or contemplating mortality — to reap benefits from the mindful reduction of stuff. 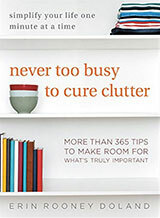 Fewer possessions mean less worry, less maintenance, and greater ease if and when you have to move (Magnusson notes that she has moved house 17 times). Plus, it puts the focus on one’s most meaningful life events on memories, not the stuff acquired along the way. 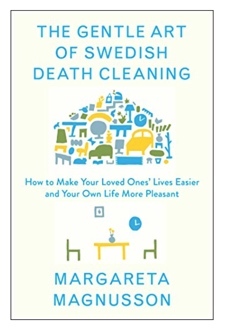 I like the idea of Swedish Death Cleaning and I’m going to give it a try. Perhaps I’ll have an update for you all in a few months. Now excuse me while I fire up some ARCH ENEMY on the stereo. Love this! Ever since my brother-in-law passed away unexpectedly, and left behind a home-based business, and all its many parts for my distraught sister to deal with at a time in her life when she was least able to cope, I have been thinking about this. I am making efforts to deal with my own backlog of stuff, knowing that I will be downsizing in the next 5 yrs anyways, and I don’t want to leave my kids or husband with the burden of my stuff. I think the paperwork is very tedious and stressful for survivors. Should they shred something, or will it turn out to be necessary? A yearly sorting of the papers in the file cabinet is an easy project for a lazy day, and such a gift for your family. Close any unused bank accounts, cancel unneeded credit cards, keep a record in one spot of bank accounts, savings, and credit cards. Also, passwords! My brother-in-law’s cell phone was locked, and my sister still had to pay the bills, until she finally found a sympathetic customer service person. This is one of the greatest gifts you can give your loved ones. My mother’s attitude toward her massive accumulation of stuff was “you can deal with it after I’m gone.” What a burden on her children and spouse. I still feel upset with her for not dealing with her possessions in a thoughtful way prior to her death. I downsized my mother several times. When she moved from her 4-bedroom house to the 3-bedroom apartment with 8 closets, to the 1-bedroom independent living with two closets, to the 1-bedroom assisted living with one closet, to the one room assisted living, to the nursing home. When she died there was little left to deal with. But the process was difficult, because each time there were so many decisions! I like the idea of dealing with my stuff on my own terms, in my own time. I hate the idea of burdening my children with it. Usually, what I do with most of these tools is to give it out to people who will find them useful. Where I live, it’s hard to find most of these organizations and groups so what I do is to look for people around me that I know will need them and give it to them. I hate having things around the house I’m not using. It always combat with my concentration and sometimes make me loose valuable productivity.